Asbestos is a term we all know, often synonymous with some toxic, mystery material. But how much do we really know about what asbestos is, and how to deal with it in our home? Asbestos is a naturally occurring mineral. For many years, asbestos was ground down for use in thousands of commercial products, making it possible for small particles of the mineral to be inhaled. This lets particles settle in the lungs, causing serious health risks. Read on to see if you can tell the difference between asbestos fact and fiction, and learn how to protect yourself and your family. Asbestos exists in 80% of structures built before 1980. While the use of asbestos has been strictly regulated sine the 1970’s these regulations only applied to new projects, not materials that were already in homes. That means if your home was built before 1980, it’s a good idea to learn how to check for asbestos before taking on a remolding project. If my home was built with asbestos based products, I’m at immediate risk. Asbestos is only dangerous when materials are damaged or old and considered “friable” (meaning materials could be crumbled by hand). An asbestos based ceiling tile in good condition shouldn’t cause harm to you or your family. However, if that tile becomes cracked, or is torn out and crumbled during a remolding project, the breakage will create a dust that releases asbestos into the air. Asbestos exposure is linked to mesothelioma, a type of cancer. Airborne asbestos is most dangers because it has been linked with mesothelioma. That’s why its important to take asbestos removal seriously, and protect you and your loved ones. 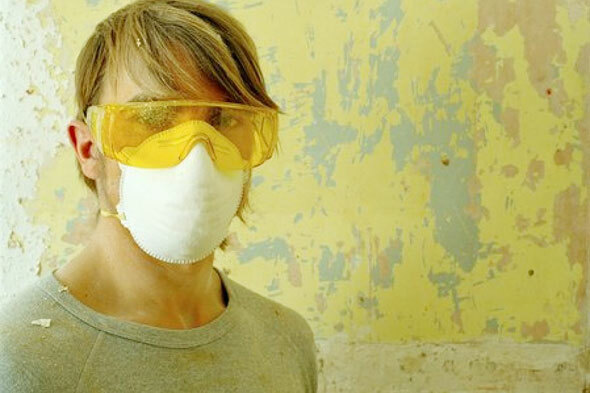 Homeowners can remove materials containing asbestos as long as they wear a mask or cover their face. Homeowners should NEVER attempt to remove asbestos themselves. Call an asbestos removal company who will know how and when to remove materials, as well as how to discard them. Find out what materials are commonly made with asbestos, and how these can affect your health.